Buy more than 1 to collect them all! Quantities are limited, buy today! What is an anime blind bag you might ask? Well, we'd like to tell you. We've taken equal quantities of all of the swords pictured and thrown them into a big giant box. 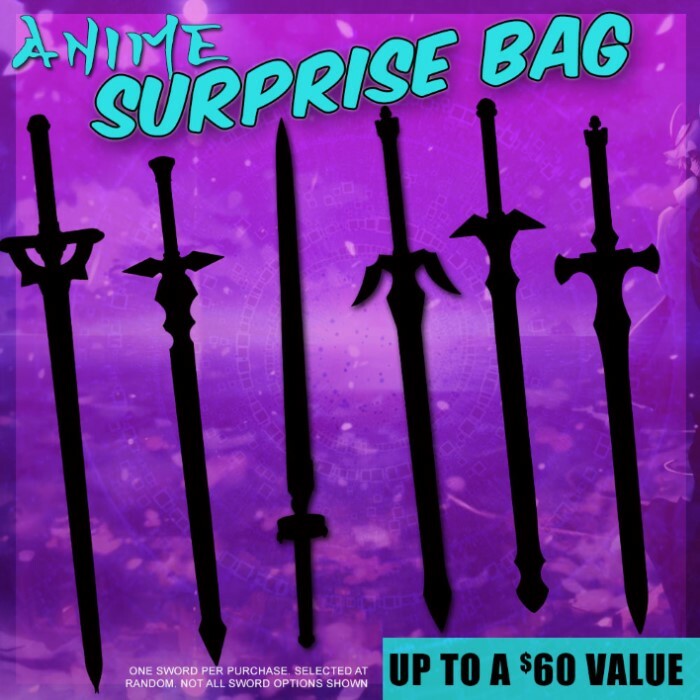 When you place an order for the anime sword blind bag, we'll close our eyes and reach in the giant box and pull out one of those swords valued at more than $50 to send right to your door. It could be the Elucidator, or it could be any of these other great swords. Either way, you're paying $29.99 for something that should cost almost double that. Your chance of receiving one of these is exactly the same as receiving another, so go ahead and order 7 and you've got a heck of a chance at getting them all! Quantities are limited, order today! You've got nothing to lose! I just got the coolest sword and thought, I need to write a review. I have bought 5 swords from this deal and thought they were all awesome. They were all worth at least 35$. Then I got one of the one I had wanted and it was amazing. This is a need to buy deal for anyone who is looking for a good sword for a great price or an anime lover who wants a super cool collectible. PS the swords are not the most durable but still will hold together when swinging around and can still hit things pretty hard. Great product for the price. There were some obvious flaws, but I wasn't expecting a perfect sword for such a low price. The blade is dull, but that is exactly what I wanted. I received Ichigo Kurosaki's sword from Bleach. Overall, it is a really nice sword and a wonderful surprise for the anime lover. I wouldn't mind buying more. I got sasukes grass cutter sword which isn't too bad but the sword is poorly made. the blade is slightly bent and the finish on the blade is very uneven and scratched along the way. Considering it was 20 dollars I cant be too disappointed but I would have liked a sword in better condition. I was a Bleach fanboy and my favorite arc was the Zanpakuto rebellion arc so getting the Muramasa sword was awesome. I am defiantly buying another box when I get the chance. Don't buy more then 1. I bought 2 and both were the same. I liked the sword but didn't want the second one to be the same. Guess that is the risk of a blind pick.